The reality TV star gave birth to her son in March. 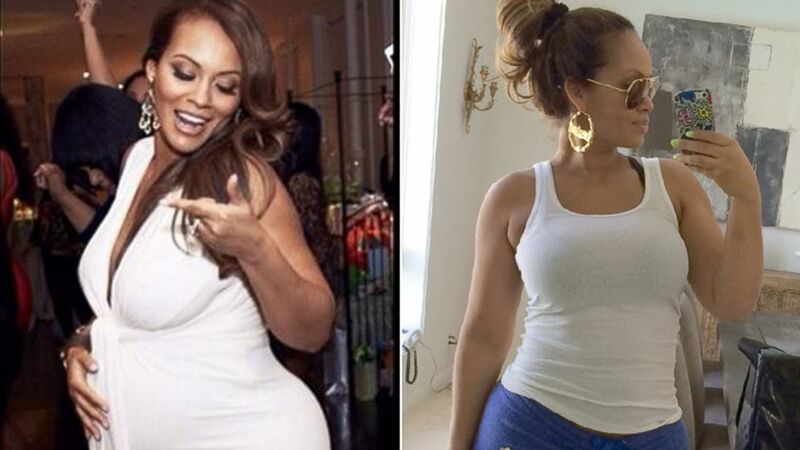 camera (Instagram.com/evelynlozada | Courtesy Evelyn Lozada) Evelyn Lozada is seen, left, in a photo posted to her Instagram account, Feb 14, 2014 and right, in a hand out photo after pregnancy. Evelyn Lozada is proud of her body and she's not shy about showing it off. Just seven weeks after giving birth to her son, she said she's already lost 30 pounds of the 42 pounds she gained during her pregnancy. "I'm proud of where I'm at so far," Lozada told ABC News. "My body feels like it's almost back to normal." Lozada, 38, and her fiancé, Major League Baseball player Carl Crawford, welcomed their first child together, Carl Leo, on March 22. Since then, the former "Basketball Wives" star has been taking the weight loss supplement youthH2O, for which she is a spokeswoman, and eating cleanly. A typical breakfast, Lozada said, is oatmeal or egg whites. Lunch is "fish and veggies with a lot of sweet potato." She also makes protein shakes, which she said includes the supplement. "I also work out three to four times a week," said Lozada, who admits to doing her own workout videos. "I have been sleep deprived lately and going to the gym can be hectic when you have no time in your schedule. But, on the days that I do have a moment, I do a ton of cardio, weight training -- which I love -- and hiking." Lozada, who has also partnered with GNC for the GNC/youthH2O's 60 day Fit Challenge, aimed to help others lose weight, is thinking about having one more baby. Right now, though, life at home with Crawford and their baby is pretty sweet, she said. "Carl is a wonderful father and awesome fiancé who has been by my side the entire time," she said. "He is so excited about baby Carl Leo. You should see them together!"